Genesio Company sells, installs and services boilers for all commercial and residential needs. We carry the complete line of Weil-McLain and Viessmen boilers. These boilers can be used in Homes, Schools & Institutions, etc. and with multiple boilers. They can be applied to indirect-fired water heating, radiant heating and more. A water boiler without tankless heater opening. Comes in 8 sizes ranging from 75,000 to 257,000 BTU/Hr. It's easy to install and setup as well as service and clean. A gas boiler for direct exhaust. (Induced draft). The water net ratings are 37,000 to 169,000 BTU/Hr. This is also easy to install & service and has unique control technology. The high-quality construction and innovative oil heating technology of this boiler provide a high level of operational reliability, high-efficiency operation and reduced emissions. Maximum heat extraction and effi ciency thanks to the triple-pass heat exchanger. Clean and effi cient combustion thanks to the stainless steel combustion chamber insert. For greater effi ciency and comfort, modulate the boiler water temperature with a Vitotronic control. Low maintenance cost with service-friendly burner and easy-to-clean fl ue gas passageways. Made with high-alloy stainless steel for hygienic hot water heating. This grade of steel does not tend to crack, peel, become brittle or corrode keeping service and maintenance costs to a minimum. Hygienic and suitable for the food industry due to high surface quality. 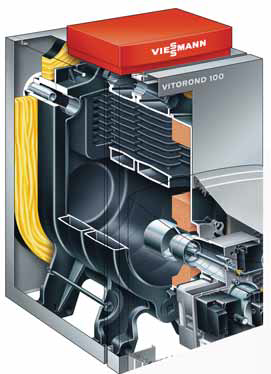 Reliable hot water comfort due to fast, even heating with large-diameter 1 1/4" non-finned heat exchanger coil. Minimal stand-by losses through highly effective foamed-in-place or wrap-around HCFC free insulation. 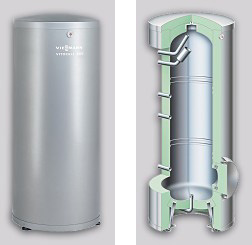 Universally suitable-for larger hot water demand several Vitocell-V 300 or Vitocell-H300 domestic hot water tanks can be combined into a multiple tank battery via common headers. Vitocell-B 300 for bivalent hot water heating in connection with solar collectors and heating boiler. 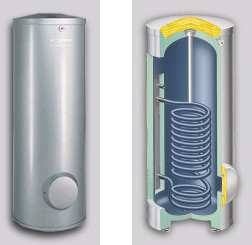 Economical domestic hot water heating the Vitocell 100 series tanks are constructed from steel and feature the Ceraprotect two-coat enamel finish. protecting all surfaces in contact with domestic water from corrosion. Corrosion-protected domestic hot water tank made of steel with Ceraprotect two-coat enamel finish. Additional cathodic protection provided with a magnesium anode. Heating of the entire domestic hot water content with the heat exchanger coil extending to the bottom of the tank. Reliable hot water comfort with fast, even heating via generously sized heat exchanger surfaces. Minimal stand-by losses with highly effective foamed-in-place or wrap-around HCFC-free insulation. Steel sheet enclosure jacket, electrostatically powder-coated-a solvent-free and environmentally sound procedure for an attractive finish.